I've knit my way through many a television show, airplane trip and sporting event. Here's a poncho I recently created. I'm thinking of writing up the pattern to include with the sale of one of my yarn bowls. What's the verdict? Would you like to make one for yourself? I went on an adventure this past weekend to upstate New York. I convinced my world-traveling, fellow-knitting friend Kari to come along for the annual Rhinebeck Sheep and Wool Festival. I also brought my fiber-inspired pottery along to sell at a popular ‘pre-game’ pop up show sponsored by Indie Untangled. It was a whirlwind. The night before the Rhinebeck Weekend I set up shop along with several other yarn-dyers and crafters. I met some great people, ogled lots of beautiful yarn and made a few sales! As a life-long knitter, I’ve been curious about the renowned Rhinebeck mecca and wanted to experience it for myself. It’s built a reputation among yarn enthusiasts as one of the best on the East Coast. The experience did exceed expectations! I got to connect with my internet clay friend Tricia Davis Zeitler. Look what she brought me! I'm having my morning cup of coffee in that mug right now! It's my new favorite. Check out Tricia's beautiful creations here. The eye candy for a fiber fanatic was mind-boggling. Not only were there scrumptious hanks of wool hanging at every turn; the attendees were all decked out in their fabulous hand-stitched finery as well. Live sheep and other furry animals, delicious fair-related food offerings and lastly knitting-related pottery and crafts were abundant. Two loops around the fairgrounds were sufficient to make some purchases and get a feel for the festival. I understand why people go back a second day to let the experience linger. Of course I couldn't resist this incredibly sweet dish made by Laura Wilensky. The animal imagery on her pots is whimsical and fun! I'm already thinking up a custom piece I'd like her to create featuring the four golden retrievers I've had in my life! The festival was a crush of fiber-happy humanity. At certain points, you could not move. Several popular booths had long lines of happy consumers chatting with each other and comparing their purchases. Guess which of these little bowls was the most popular at my sale. 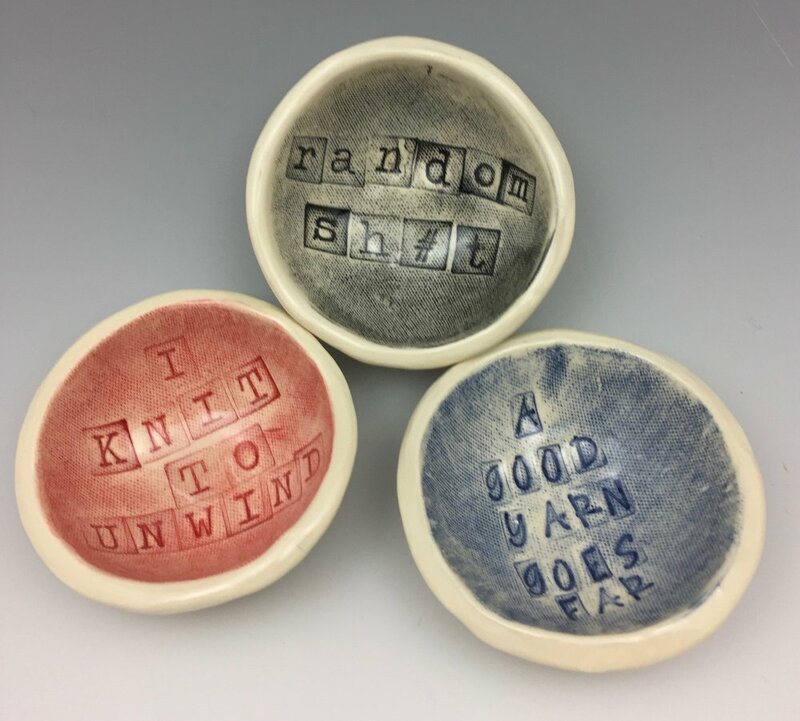 I had several requests to make the 'potty-mouth' one in a larger size (the ones pictured here are about 4 inches in diameter and meant to hold small items). Want one of these for yourself? Click here to send your request and tell me if you'd like one in a larger size! I observed, absorbed, explored and talked to many of the vendors and participants throughout the weekend. I learned that word-of-mouth is a powerful resource for creating interest and desire for certain artisans. As much as sales through the internet are a strong tool for crafters, that face-to-face shared experience of meeting an artist, seeing their creations in person and participating with them in a fun event can still be one of the best ways to connect an artist and consumer. I have several local shows lined up in the next few months. Although they won’t attract the number of participants like Rhinebeck, they will be fun events to attend, shop and meet up with the creators of some fantastic art. Next up on my calendar is an annual craft show near Columbia, Maryland. I'll have lots of pottery with me including holiday gift ideas, serving pieces and decorative accents. I look forward to seeing you there!